Providing you the best range of auto colorimeter microprocessor with battery backup, photo electric colorimeter, microprocessor flame photometer, digital photoelectric colorimeter-(8 filters), digital analogue photocolorimeter and digital photo colarimeter abs trans with effective & timely delivery. 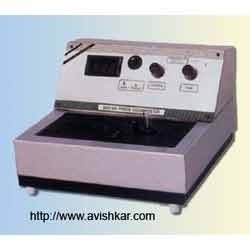 We are recognized as one of the foremost manufacturers, suppliers, and exporters of an impressive range of Microprocessor Photo Colorimeter including Auto Colorimeter Microprocessor With Battery Backup. 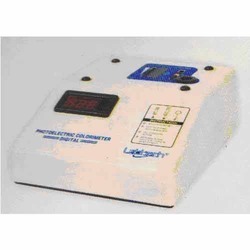 This is microprocessor based and technologically advanced colorimeter that is capable of precise analysis of samples by offering seamless function with battery back-up facility. These require very short warm up period and offer outstanding display of results. These are made by using high end technologies in state of the art manufacturing facilities and widely used in leading laboratories for their seamless performance. Our esteemed clients can avail these at very reasonable prices. We are engaged in offering an impressive gamut of premium quality Microprocessor Photo Colorimeter including Photo Electric Colorimeter. This is designed to measure the concentration and constituents of body fluids such as urine and so forth and is widely used in reputed laboratories to analyze various constituents. It is provided with eight high optical glass filters having a wide range and a hermetically sealed imported photodiode detector. We observe rigid standards of quality in accordance with international norms and offer a flawless range to our prestigious customers at very reasonable rates. Packed in thermocol box, further packed in corrugated box. We are backed by vast domain knowledge and a sound technological expertise to offer a premium range of Microprocessor Photo Colorimeters including Microprocessor Flame Photometer that is extensively used for analyzing urine samples in leading clinical laboratories and hospitals. It is provided with highly sensitive sodium and potassium filters whereas lithium and calcium filters are optional. 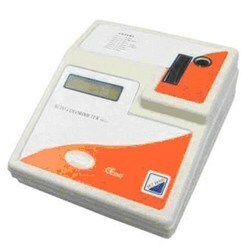 It has best Alphanumeric LCD display that facilitates direct reading. These are provided with auto-ignition facility and gas can be controlled with a knob. 20 x4 character Alphanumeric LCD display. Our constant efforts to offer an impressive gamut of premium quality Microprocessor Photo Colorimeter have enabled us to offer Digital Photoelectric Colorimeter-(8 Filters). It has been exclusively designed to measure the concentration as well as constituents of various body fluids such as urine and is widely used by reputed clinical pathologists to study various constituents of body fluids. It consists of eight high optical glass filters having a wide range with hermetically sealed imported photodiode detector and. It facilitates direct measurement of optical density or per cent transmission with digital display. We follow rigorous standards of quality by adhering to international norms and offer a perfect range to our prestigious customers at budget friendly prices. 40 (400), 49 (490), 52 (520), 54 (540), 59 (590), 62 (620), 65 (650), 70 (700) nm. 6 V, 10W, Tungsten Lamp. A 135 mm. 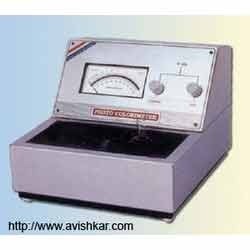 meter for direct measurement of optical density or % Transmission. We are manufacturing, supplying, and exporting a huge gamut of Microprocessor Photo Colorimeter such as Digital Analogue Photocolorimeter. It is designed for highly accurate analysis of fluid samples. It is provided with premium quality filters and requires as small as 1 ml volume of sample. These are precision engineered and have a highly sensitive photocell that ensures impeccable photometric accuracy. These high end instruments consume less energy and are highly energy efficient. We maintain extremely rigid standards of quality as per well defined industry standards and offer these at reasonable rates to our valued clients. 400 (V), 490 (B), 520 (G),590 (Y), 650 (R) nm. + 1.0% of full scale.